This quality Air Hockey table measures 67″ x 39″ x 31″, 3mm MDF playing surface with poly finish and 12mm plywood side and end apron. It also includes manual slide scoring, one air channel 3-3/4″ square wooden legs with caps & leg levellers and 4 pushers and 6 pucks. This high quality Air Hockey Table’s playing field is made of very strong and smooth laminate with multilayer wood cabinet and built in fan with a great volume of air. The cushions are designed to prevent disc from falling off playing field, and also steel folding and adjustable legs. Other handy features include easy access to electronic components, removable door, single coin box and digital electronic score keeping. 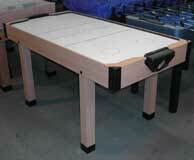 This quality Air Hockey table measures 60″ x 32″x31″ with a 4.75mm MDF playing surface and poly finish. It also includes manual slide scoring, one air channel 3″ square wooden legs with caps and 2 pushers and 4 pucks. These Tables are Australian Designed, Australian Manufactured, Australian Owned and come with a 10 year warranty!